Mandi, the owner of Anchorage Ayurveda and Bodywork, contacted us less than a week ago asking for our full range of services – website hosting, website design, domain name management, and logo design. Mandi gave us a few different websites to reference as she noted that she wanted a very simplistic website that was easy to navigate. Upon her initial payment, we worked on the website and logo right away. Just today, everything has been fully completed and approved! Our graphic designer did a great job working with Mandi and completed the logo in a few days. It took just a few more tweaks to the logo to make it perfect – and it was done! The website was also completed a few days ago with the final touches on the site done today. We appreciate the business from Mandi! 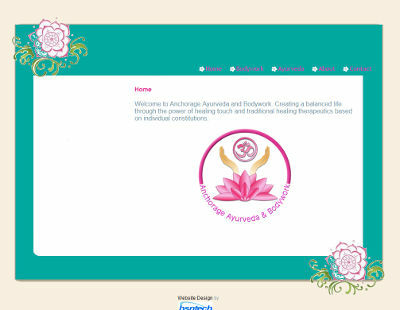 The Anchorage Ayurveda and Bodywork website is at anchorageayurvedaandbodywork.com.